Esplanade Homes: Why wait a year to build your dream home? If you want to play golf and enjoy your time in Naples RIGHT NOW, this is the place for you! This is a brand new (not lived in!) Home just newly completed in January 2019. A large Mercede model right on the Golf Course with lake views and lots of upgrades. This home has the custom home automation "doo dads" and designer upgrades you want and need, but it can still be customized and decorated just the way you want! Buy this one now, or wait till next year to enjoy your time on the golf course! On the Golf Course, lake view, private spa, huge lanai, 3 car garage, fire pit ready, media room, home office, huge pantry, impact windows, walk to the clubhouse...You name it, this home has it all! And neighborhood construction is just about complete... Note that Mapping information may be incorrect as maps have not been updated since street was completed. The Home is in Esplanade Golf & Country Club. Esplanade Homes: BRAND NEW, AND BETTER! Once your heart is captured by this amazing community and you start looking for your dream home in the community, you need to make a stop at this BRAND-NEW home. The current owners have done all the work for you... added designer lighting and finishes, paid all the up-front builder fees, made gorgeous and timeless selections... you just need to move in to enjoy the rest of the 1-year builder's warranty. This Lazio home is one of the most popular floor plans because of the open flow and generous rooms. The selections in this home from the gorgeous wood floors and quartz counters to the light cabinets and high tray ceilings give it wide appeal. The over-sized covered lanai provides great entertainment space, while the serene pool and hot-tub provide fun and relaxation overlooking the lake. Extended covered lanai, bay windows in bedrooms for extra space, extended master closet, crown molding just to name a few. Although not every home in Esplanade comes with a golf membership, this one does... and the best part is that there are no up-front expensive initiation fees, it is just part of your HOA. See it! Love It! Make It Yours! Esplanade Homes: Lazio Pool Home w/ gas fireplace, extended garage, tray ceilings, French doors, upgraded cabinets, counters, tile, 5 1/4 crown molding, gourmet kitchen, laminate wood floors & more. Bundled Golf, resort clubhouse, tennis & more. Move in Fall. Photos are of the model and not actual home. Esplanade Homes: Highly sought after "Lazio" open floor plan with great room & split bedrooms. Golf Membership included in this home! Kitchen is to die for! Oversized island, 42 inch cabinets, walk in pantry, and upgraded appliances! As if that wasn't enough, this home also has a fabulous outdoor built in kitchen with a partial covered area as well as open area to enjoy the luxurious pool and spa! This outdoor area is the reason people move to SWFL! Master bedroom is dreamy with bay windows! Master bath comes with vast walk-in-shower and dual sinks and every ladies dream size enormous walk in closet! Other features include, two en suite bedrooms, spacious den easily can serve as a fourth bedroom, grand foyer, fabulous laundry area! Private view with lots of hedges put in place for privacy and also lake view to enjoy while you are swimming in the pool! Esplanade Golf & Country Club is the hottest selling new community in Naples, The amenity center includes a state of the art gym, spa, zen room, cafe, tiki bar dining outside by the resort style pool. Golf course, tennis courts, & a new clubhouse in the process of being built. Very desirable North Naples location! Esplanade Homes: Under Construction - 2275 Sq Ft. 3 Bedroom, 3 bath with a den. Beautiful Custom Pool. Gourmet Kitchen ,roughed for outdoor kitchen, Crown Molding Throughout Loaded with upgrades. Call sales center for details. Photos of Model. Esplanade Homes: ESPLANADE GOLF & COUNTRY CLUB NORTH NAPLES PREMIER BUNDLED GOLF COMMUNITY... This better than new, open concept great for entertaining, 3 Bedroom, 2 Bath single family home sits on an extra wide lot with one of the longest lake views! Upgraded kitchen cabinets, a GE café series gas range top, wall oven, microwave and dishwasher. A quartz topped over sized island faces the extended screen lanai and outdoor kitchen with a Bull gas grill, Bull refrigerator and sink. Master bath has huge walk-in shower, separate vanities with quartz tops. Bay windows in Master offers views of lake, with plenty of room for a pool, this home is already roughed in with gas line and electric service for just that. Whether permanent residence or weekend get away, Esplanade Golf & Country Club is the place to be! 18 hole Championship Golf Course membership included, Resort Style Pool with Cabanas, Bahama Bar with Food & Beverage service, Spa, Hair Salon, Fitness Center, 6 Tennis Courts, 4 Pickle Ball Courts, 2 Bocce Courts, 14 miles of Walking/Bike Trails, Dog Park, Learning Center, Social Director. New Club House coming soon! Just 5 min to I75, 25 min to Airport, 15 min to the Beach, 20 min to 5th Avenue. Esplanade Homes: Resort Only- No Golf membership, Farnese Pool home is a 2,100 sq. ft. single-family home filled with flexible space options. The foyer leads to separate den and dining rooms which may be open or closed with optional double doors. The great room is adjacent to a designer kitchen with its own breakfast nook and spacious counter top island. The Master Suite includes a bay window, dual sinks, corner shower, water closet and walk-in closet. Pool and more designer touches make this a must see home. Esplanade Homes: AVAILABLE NOW and Move In Ready! This popular "Lazio" floorplan home is located on an oversized and heavily landscaped corner lot in the "Resort Only" Section of Esplanade G&CC. Offering 3 Bedrooms (each with ensuite bath), Den, 3 Full Baths, and 2275 Sq Ft under air, this open Great Room style floorplan is ideal for entertaining and offers a large Gourmet Kitchen with White Wood Cabinets, Quartz Countertops, GE Profile Appliances including Gas Cooktop with Vent Hood, Wall Oven, and French Door Refrigerator. All baths have upgraded tile, cabinets, and quartz countertops. The large screened lanai has pre plumb for an outdoor kitchen/bar with water and gas hookups. Other fine appointments include planation shutters throughout, wood floors throughout the common areas, crown molding, tray ceilings, and more! ESPLANADE G&CC is North Naples Hottest RESORT STYLE community offering residents Resort Style Pool with Cabanas, Bahama Bar with Food & Beverage service, Spa, Hair Salon, Fitness Center, 6 Tennis Courts, 4 Pickleball Courts, 2 Bocce Courts, 14 miles of Walking/Bike Trails, Dog Park, Learning Center, Full Time Social Director, and 3 additional restaurants to come! Esplanade Homes: LEAST EXPENSIVE GOLF MEMBERSHIP SINGLE FAMILY! THE BEST VIEWS OF THE LAKE & GOLF COURSE! This immaculate 2 Bedroom + Den, 2 Bath FULL GOLF MEMBERSHIP single family home is located on an extra wide lot with room for pool. Offering almost 2000 sq ft under air, this great room style home lives big with huge kitchen including 6'x14' island and extended screened lanai with tons of room for entertaining! Other fine appointments include NATURAL GAS cooktop, outdoor kitchen pre-plumb incl gas line, pocket sliding glass doors, bay windows in both bedrooms, new flooring in the bedrooms, granite countertops throughout, new backsplash, stack stone elevation, paver driveway & lanai, room for pool, and more! Esplanade Golf & Country Club offers a unique lifestyle with something for everyone! 18 hole Championship Golf Course, Resort Style Pool with Cabanas, Bahama Bar with Food & Beverage service, Spa, Hair Salon, Fitness Center, 6 Tennis Courts, 4 Pickleball Courts, 2 Bocce Courts, 14 miles of Walking/Bike Trails, Dog Park, Learning Center, Full Time Social Director, and 3 additional restaurants to come! 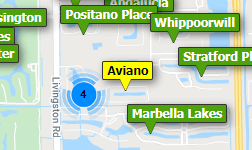 Just 5 min to I75, 15 min to Mercato, 20 min to the Beach, 25 min to 5th Avenue. Need professional assistance selling your property at Esplanade Naples? Find out how an Area Specialist can help to generate more property exposure in order to get the most money for your investment in the least amount of time.